Last but not least, I’ve gathered up an epic list of 36 DIY baby shower decorations to round out this baby shower series. I’m certainly feeling ultra prepared to host the next baby shower and I hope you do too! I’ve got one planned in a couple weeks’ time and I’ll be using a lot of the freebies, food and gift ideas that I’ve shared in the past 5 posts. I’m actually really looking forward to putting together the favors with the printable tags I created! 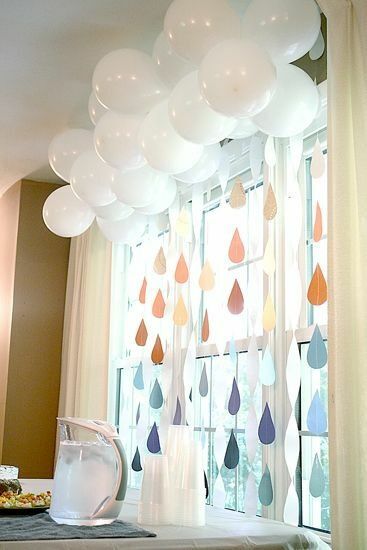 This post is full of DIY ideas for baby shower decor. From garlands to balloons to photo booth and flowers. You name it, I rounded it up! Unless otherwise indicated, every link goes to a tutorial or set of instructions. Several of these ideas are actually bridal shower diys, but they are totally appropriate for a baby shower too. It’s nice to create a little decorated vignette where people can step aside to and take some lovely pictures together. In the future it will also be really nice to look back at the photos and easily identify what the occasion was. I know what you’re thinking “I would NEVER forget my first baby shower! Perish the thought!”, but I literally just tried to recollect my first baby shower and I drew a blank. Thanks for nothin’ mom brain. Here are some pretty ideas for photo backdrops to combat that troublesome and forgetful mom brain syndrome. Most of these garland ideas could easily be saved and re-purposed for other parties. They aren’t solely suited to a baby shower. Well, maybe the baby sock clothesline is, but the rest could be used as birthday party decor or even nursery decor! I like that these would all be fairly inexpensive to create, you could likely find all the materials at the Dollar Store. Mini Onesie Garland – I made these onesies in 4 colours. Simply print them off, cut them out and either thread them on some ribbon or sew them together. Click here to download the green, purple, pink or blue onesie printables. I’m always at a bit of a loss for what to do with balloons. I blow them up… then what? I usually just randomly tape them to the walls. Haha! These ideas are wayyyy better! Rain Cloud – Photo inspiration only, but I designed some simple raindrop printables you can download here. You can print them off on some pretty scrapbook paper for a fancy raincloud! Every party needs a few fresh flowers to add a little life to the festivities. I absolutely adore the hanging carnations, they are my favourite flower and this is a gorgeous way to fill up a wall! DIY Flower Crown – I think this would be really sweet for the mom-to-be! Flower Paper Lanterns – This DIY uses fake flowers, but it would be gorgeous with fresh! These are a great way to fill up some wall space if you’re hosting the shower in a church hall or conference room type of space. They would also be great for an outdoor party but they might be a bit much in a cozy living room. I wasn’t sure if these DIY’s should be categorized with the garlands or not. They’re kinda similar but kinda different. Plus the garland list was getting long! So I decided that the garlands are anything strung up and draped along a wall. And these streamers are anything either hanging down from the ceiling or made using actual crepe paper streamers that you buy on a roll. That’s it for this DIY Baby Shower Series! Be sure to check out the other posts on printables, food, favors and gifts. And let me know in the comments if there’s anything you would add to this list of DIY baby shower decorations! These decorations are so beautiful! I love the bright colors used. I love all of these decorating options, especially all the different garland options. Pinning to refer back to for the next party I’m planning! Thanks for sharing! I love the photo backdrop trend, they are always just so fun! Thanks for the ideas! Yeah, they make for great photo memories! I love all of your helpful links! I’m pinning this so I can find it next time I throw a baby shower! Some great DIY ideas here! I think my favorite is the paper chain backdrop. Inexpensive and adds a pop of color. Thanks for the roundup! Thanks Andrea! I love how colourful the chains are! One of the best party decor round-ups I’ve seen! I don’t know which one is my favorite here! I love making my own festive decorations for parties. Gives it so much personality and I think it makes your guests feel more welcome. Oh thanks so much Jen! I agree!